Not only does my quest for a World Championship continue to elude me, but come to think of it I can't seem to even win my local club events... in fact, I can't even beat my home game. 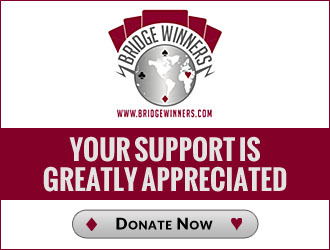 In which decade did you first start playing bridge? How many people have you introduced the game of bridge to? 8 Teams Remain: Who Wins the Bermuda Bowl? In the Heat of the Moment, What Would You Bid?